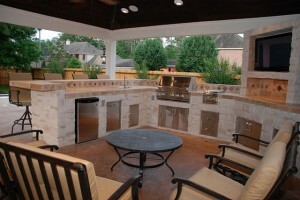 Outdoor kitchens are becoming a very popular trend in Houston. Backyard kitchen plans have us busy all the time, and business has increased threefold in the past few years! At least we think so, after reading another Houston Chronicle article about how the Exxon Mobil campus just south of The Woodlands is going to spur more high-end home development in Houston’s northwest quadrant. One of the many outdoor kitchens and patio covers featuring high-end amenities like an AV system, fire pit, wet bar and dining area. Well, we’re pretty excited about this growth in outdoor plans – especially since outdoor living spaces have become such a popular component of high-end homes. Kalamazoo Outdoor Gourmet, a company that manufactures equipment for high-end outdoor kitchens in Kalamazoo, Mich., says the average outdoor kitchen it built in 2012 cost $40,000, up from $30,000 in 2010. “We’re selling bigger and bigger kitchens every year,” says Steve Adolph, the company’s president. Last year, the company introduced a dishwasher specifically designed for the outdoors. It’s built with a stainless-steel casing, specialized tubing and electric systems and a “winterization mode” for the off-season. Particularly hot, according to the article, are outdoor kitchens called “summer kitchens” and furnished backyard living areas. only want bigger covered patios and covered outdoor kitchens, but more appliances and amenities – often built into natural stone islands with granite or stone countertops. 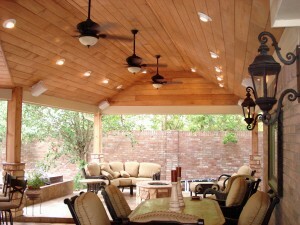 Among the popular bells and whistles are outdoor pizza ovens, professional-grade grills, Big Green Egg ceramic charcoal cookers, media rooms with fully integrated AV systems, flat-screen TVs, wet bars with Kegerators and sinks, water features like fountains and waterfalls, natural stone structures and fire pits and fireplaces. Another local trend we’ve seen echoing this nationwide movement toward bigger and better outdoor kitchens, patios and living spaces is the reworking of existing space to make way for more backyard living. (This was also mentioned in the Wall Street Journal article). We’ve seen this a lot in the city of Houston and its inner-ring communities to the west and northwest. Old homes with outdated floor plans are razed to make way for more modern layouts – and part of the new layouts are outdoor living spaces. One of the drawbacks in some of these cases, is a lot size that’s smaller than a homeowner’s dream for a backyard retreat. That’s where our outdoor small-space kitchens have proven particularly popular. It’s also where hiring professional designers like Outdoor Homescapes of Houston comes in handy, because we have 3D landscape software allowing you to see the project before it’s built. Our expertise with outdoor kitchens and patio covers also allows us to improve functions like storage, conversation areas and traffic flow while keeping the look and amenities you want. 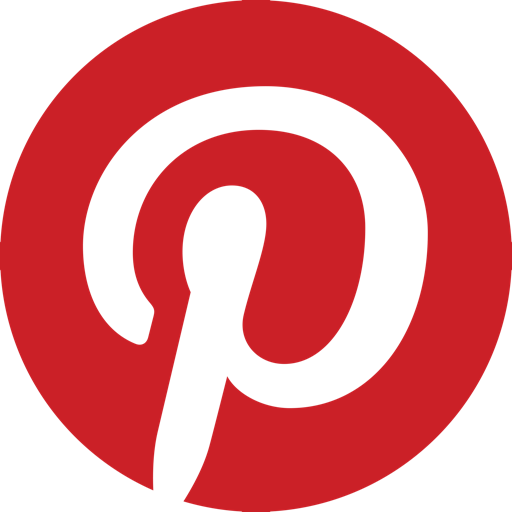 We’re not just trying to sell off old inventory. Well, we’ll just have to see if this “tsunami” of high-end home development around the Exxon Mobil campus leads to a boom in outdoor living spaces. But considering that Houston’s household median income and home sales are nearly double the average of the rest of the country, we’re willing to bet that this will be the case!